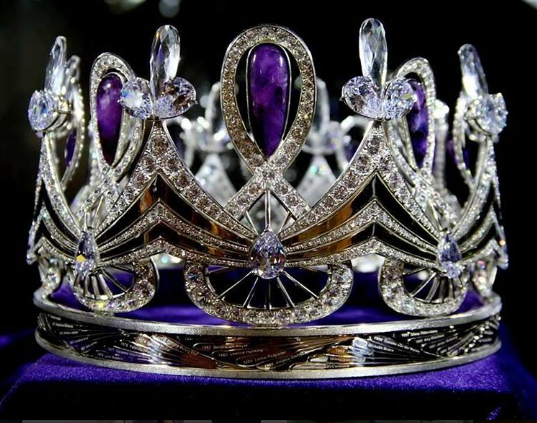 The official crown of Miss South Africa Beauty Pageant. Titled "Enhle" which means "beautiful one" in Zulu, the name was chosen through a social media competition which attracted hundreds of entries. A prominent feature of the glittering masterpiece is the infinity sign to which is said to 'symbolise the enormity and ongoing nature of Miss South Africa’s role', not only during her year of reign but into the future. The crown’s three largest stones are sugilite (also called luvulite and sold as the stone of love) which are often associated with royalty, thanks to their purple colour. These were mined near Hotazel in the Northern Cape. Other stones used in the crown are amethyst and white quartz crystals.